As the dark nights return once more, our Blackburn Buccaneer XN974 is now part way through some winter overhaul work. XN974 was one of the prototype Buccaneer S Mk2 aircraft and the first production aircraft, making her maiden flight on 5th June 1964. Destined for a busy life, not as an aircraft on regular military service, but as a trails aircraft used to pioneer deck landings at sea and also new weapons systems. In between spells flying from the Aircraft and Armament Establishment at Boscombe Down, she lived her life on a variety of aircraft carriers, mostly wearing her Royal Navy colour scheme, before finally arriving here in 1991. Since then she has been kept in ground running condition but in recent times, she has started to show her age, both cosmetically and technically. Our engineering team began work late this summer to restore her to her former glory, including solving the technical issues and repainting her back in her original Navy colour scheme. Andre Tempest accessing those hard to paint areas. Andre Tempest has been busy preparing her surfaces for the new colours, which is a huge job involving intricate access platforms to reach her tall tail fin and elevators. Meanwhile, engineering volunteers Olly and Mick, together with Grant Sparks, have been working to rectify some technical issues. First job was to get the brakes back on top form. The 1960’s anti-skid brakes are relatively simple by modern standards, but still involve renewing the system with large quantities of hydraulic fluid and bleeding the system to give a firm brake action. Work will be continuing through the winter to return her to a lovely Royal Navy colour scheme that she wore back in the 1960’s. If all goes according to plan, she will once again be part of our Thunder Days. 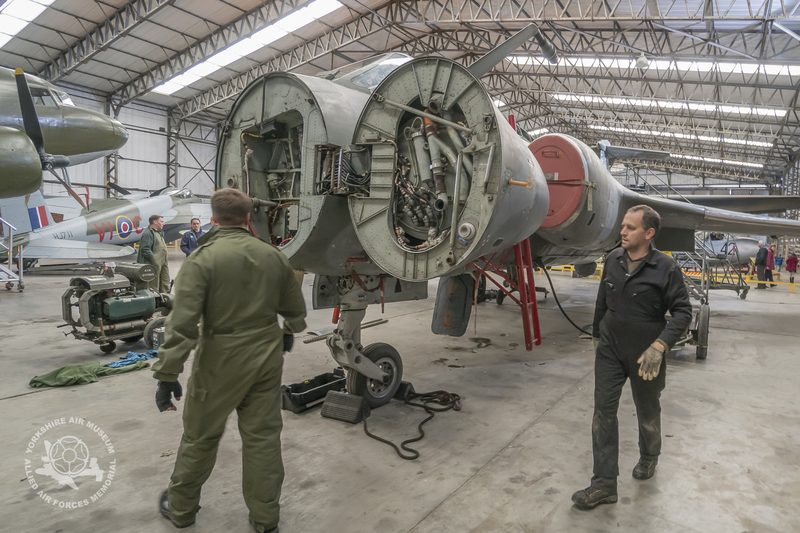 If you visit the Museum, you will be able to see first hand the work in progress as our team of engineering volunteers work to keep this valuable prototype aircraft in good shape and ready for summer 2017. We’re looking forward to hearing those engines spinning up to speed as that Royal Navy paint scheme shines in the sun.